Each seat cover is hand sewn and custom made. Our tailors hand cut your seat covers to ensure a precise fit. Protect the integrity and value of your car's delicate interior. Our car seat covers are durable, comfortable and easy to wash. Installation is complete in 3 easy steps. A precise fit makes for a luxurious look and feel. Have your car's style and brand silk screened on your seat covers. A variety of colors allow you to get the perfect match for your vehicle. Each seat cover is composed of 3 pieces. Your seat covers are guaranteed for 1 year. 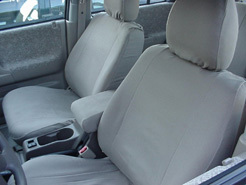 Denim seat covers keep you cool in the summer and warm in the winter. Have questions or need assistance with placing your order? Please call us at 1-800-779-3167. If you are purchasing more than 1 set of seat covers, you must add each set to your shopping cart 1 at a time. Please fill out individual forms for each order. $12 Standard UPS and USPS Priority Mail shipping included for all orders in the Continental U.S.A.
1 & 2 Day Air Delivery Service Available for U.S. Customers Only. i.e. Convertible, Extended Cab, Crew Cab, Sedan, Hatchback, etc. To add the back seat or middle seat, click Keep Shopping when reviewing shopping cart. What style is the row of seats? Give us information about the headrests in this row. Note: Your monitor and/or printer's color settings may cause a slight variance from the actual colors of our seat cover materials. To ensure a perfect color match for front and back seats, we recommend you order them at the same time. Please select the following optional features your seats have so that we can include provisions for their respective controls, knobs, etc. *Lumbar support is a controllable lower back support bar in your seat that you activate by a control mechanism such as a switch, knob, lever, etc.